Beautiful set, not as soft as I had hoped but it looks serene and calming in my room. Colors are are subtle. Freshen up your space with the modern style of Madison Park's Karyna 8 Piece Cotton Sateen Duvet Cover Set. Flaunting a chic geometric print in vivid aqua and white hues with printed metallic details, this duvet cover adds a striking contemporary appeal to your bedroom. A solid grey reverse provides a neutral touch to duvet cover, while matching shams spread the stunning look to the head of the bed. Three decorative pillows incorporate embroidery and fabric manipulation to add charm and texture to the top of the bed. Made from cotton sateen, this duvet cover set has an elegant sheen and is machine washable. Two pillowcases with geometric embroidery along the hems are also included to complete the collection.A duvet cover is a protective cover for your comforter, most likely for your down comforter. Sometimes it's referred to as a comforter cover. Duvet covers are not filled. It has an opening where you can insert your comforter. Filler not included. Comforter insert not included. The product information was correct and was delivered as promised. The duvet set and pillows are really pretty. The color is a little lighter than expected, but still really nice. It is a light teal and gray. I have has the set for a month or so and received a lot of compliments on it. I really like the pillows too. My husband even likes the set! The colors are just like pictured. The pillows have metallic threading in some. The cover isn't as soft of as a material as I would like. It is more polyester than cotton, but the description says sateen. Absolutely love the color and the feel of this duvet cover. Very beautiful, colorful, but not loud. Love the colors & pattern. Soft & muted. Fabric is thin, but surprising how much I do like it. It also is easy to smooth out and it doesn't wrinkle easily. Ties on the inside corners to hold your down comforter in place. Buttons all along the bottom keep it nice and tidy. A good purchase! looks not bad. Exactly as on the photo. like the design .But i was thinking that cover set was made of 100 % cotton . But it was not. Mostly made of polyester. That the reason for return. Beautiful set. Pictures do not do it justice. Very versatile and well made set. 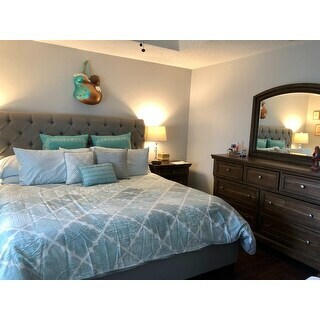 This set coordinates well with many decor styles. We have received many compliments on thus ensemble. Great color scheme for my room. Good quality. Goes well with grays and colder tones. Teal really pops and adds character. Time will tell to see how the quality holds up but I do not see any issues in the near future! Beautiful! Just as it looks in the picture. So many pieces! 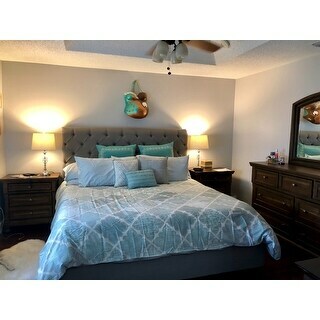 It really helped to pull together my guest room and it is the perfect compliment to the Safavieh Adirondack Vintage Ombré Ivory/Silver rug. This is nice quality and was a good price. Shipping was fast and I had no issues with packaging or the product. The colors were as pictured on the website and the fabric is nice. This is a very nice set that washes well and looks good. Not a huge fan of the metallic colors though. It's exactly what I was looking for. I would recommend to a friend. Loved the color and style, plus matching pillows, shams, and accessories. "The Euro Shams pictured here, are they sold on Overstock? If so, how can I find them? (Overstock should offer a “also pictured here and available for purchase” row in the listing)"
I would like to know the answer to the above question regarding the Euro Shams to match the covers that I bought - they are not sold here in Australia.